Formic Pro Now Registered For Use In Canada! 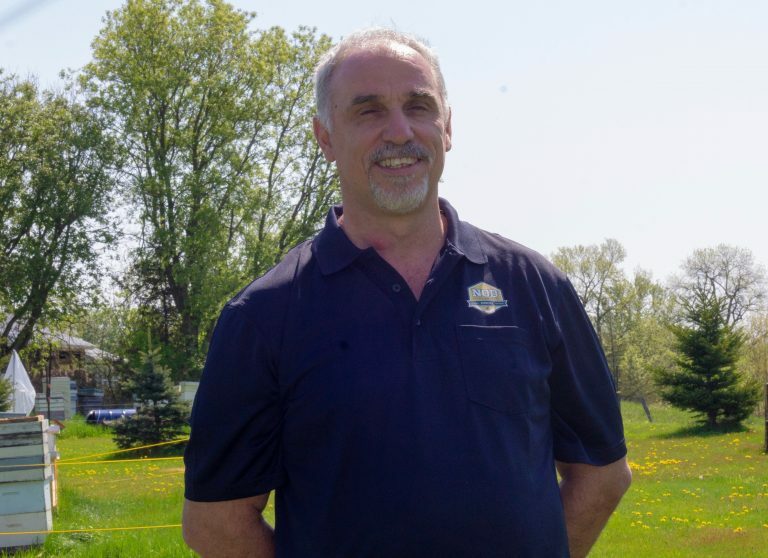 NOD Apiary Products is pleased to announce the Federal Pest Management Regulatory Agency (PMRA) has granted the Canadian registration of its newest all natural varroacide, Formic Pro™. It is a third generation product 20 years in the making. 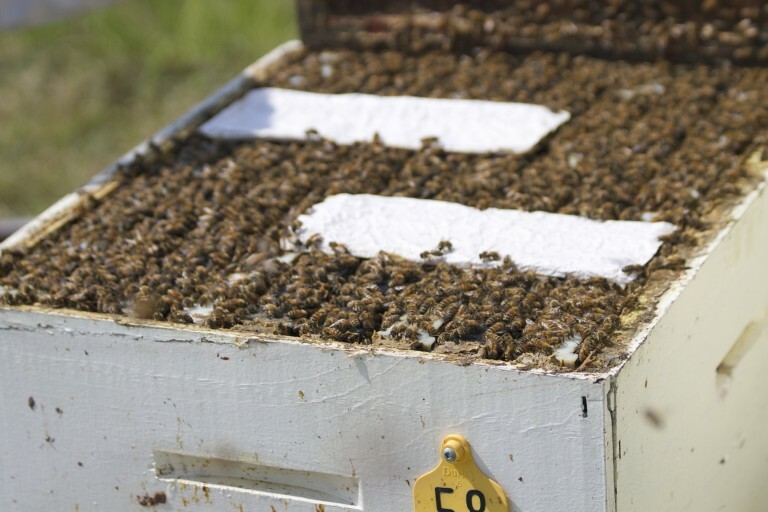 Key advancements in its bee protection technology include a longer shelf live, easier storage conditions and reduced packaging, pleasing distributors and beekeepers alike. NOD Apiary Products is the winner of several awards, including the Ontario Premier’s Award for Agri-Food Innovation Excellence 2006, Innovation Project of the Year 2008, Agri Business of the Year 2011, and most recently the Quinte Manufacturing Association’s 2018 Trailblazer of the Year Award. NOD Apiary Products Ltd. is a Canadian company formed in 1997 by beekeepers. Honeybee and animal health is our focus. The founders saw formic acid as the active ingredient most likely to be developed into a practical, organic, sustainable miticide for the beekeeping industry. Properly formulated, it could control varroa and tracheal mites, protect the image of honey as a wholesome food, and leave no residues in the hive components. 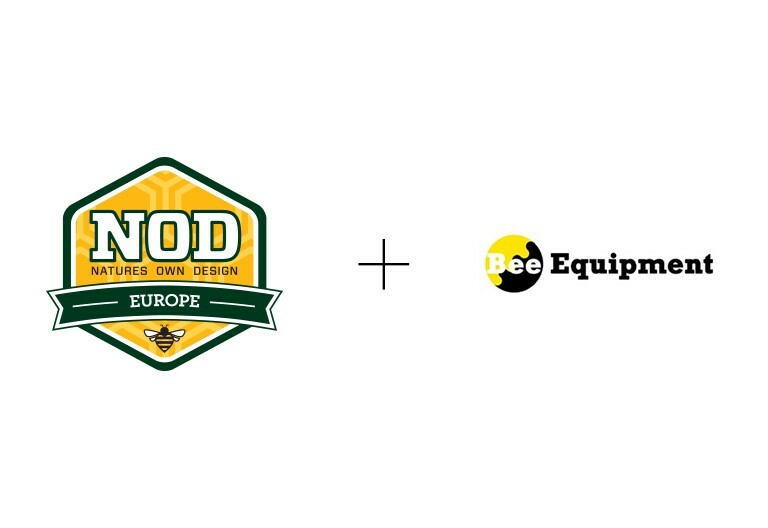 Our global reach at NOD Apiary Products Ltd. continues with operating subsidiaries in the United States, NOD Apiary Products USA Inc., and in Europe, NOD Europe Ltd., to be able to serve the beekeepers in those regions. Our passion is honey bee health and young livestock wellness, and as such, we are dedicated to environmental stewardship. MAQS+ has arrived in New Zealand! 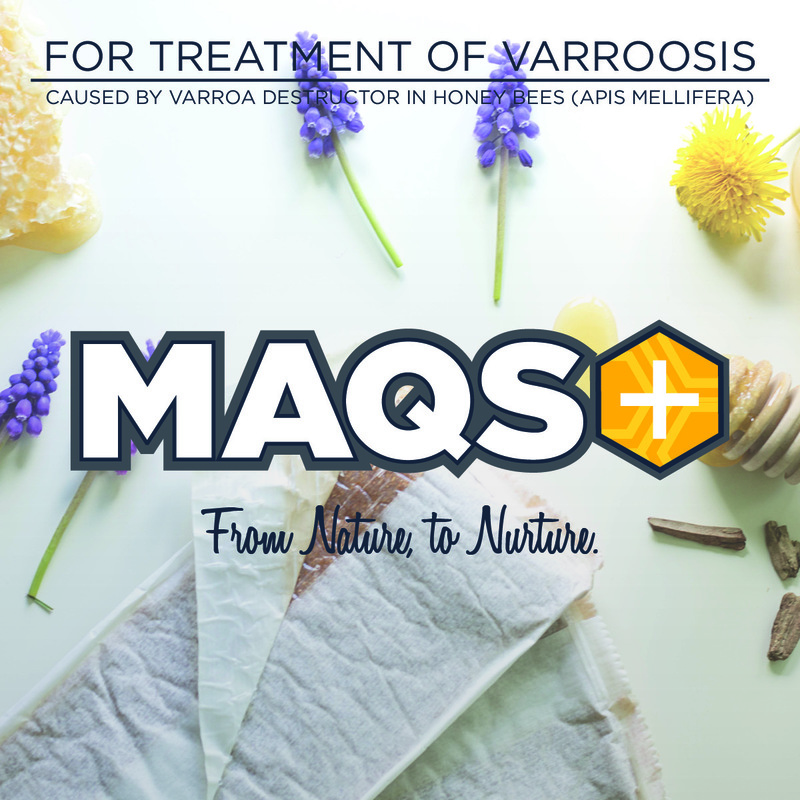 MAQS+ are the newest Formic Acid polysaccharide gel strip for the treatment and control of Varroosis caused by the Varroa Destructor in Honey bees (Apis Mellifera). MAQS+ has a 24-month extended shelf life. To purchase, visit our exclusive New Zealand distributor Ecrotek. Frankford, Ontario – NOD Apiary Products is pleased to announce the New Zealand registration of its newest all natural varroacide, MAQS+™. The new product features a 24-month shelf life that distributors and beekeepers in the New Zealand marketplace have been seeking. “Since its first introduction to the global industry in 2011, millions of honey bee colonies worldwide have been effectively protected from mites by Mite Away Quick Strips™ (MAQS™); yet our distributors were seeking an additional product with more lenient storage conditions while continuing to provide to their customers all of the easy to use characteristics of MAQS™. The registration for MAQS+ is a full-dose (2 strips) 7-day treatment. MAQS+ has an average of 83-97% efficacy and causes mortality to a significant number of mites under the brood cap as well as adult mites on the bees. MAQS+ does not require temperature controlled storage. MAQS+ is an all-natural product that is fully bio-degradable and can be used during the honey flow without leaving residues in the honey or wax. In New Zealand, there is a 14-day withdrawal post treatment. MAQS+ is organically certified through BioGro NZ. 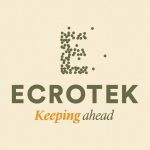 MAQS+™ will be available through Ecrotek Beekeeping Supplies. www.ecrotek.co.nz 0800-11-77-66. The first shipment is set to leave Canada by the end of September. On the horizon is another invasive mite of the honey bee: Tropilaelaps. NOD has been working with researchers in Thailand, testing MAQS+™ against these mites. Our product proved to be the most effective. Incursions of this mite are being monitored in New Zealand. Should it appear, with an amendment to the label the beekeepers will have a readily available tool to control it. NOD Apiary Products Ltd. is a Canadian company formed in 1997 by beekeepers. Honeybee and animal health is our focus. The founders at NOD saw formic acid as the active ingredient most likely to be developed into a practical, sustainable miticide for the beekeeping industry. Properly formulated, it could control varroa and tracheal mites, protect the image of honey as a wholesome food, and leave no residues in the hive components. Our global reach at NOD Apiary Products Ltd. continues with operating subsidiaries in the United States, NOD Apiary Products USA Inc. and in Europe, NOD Europe Ltd., to be able to serve the beekeepers in that region. 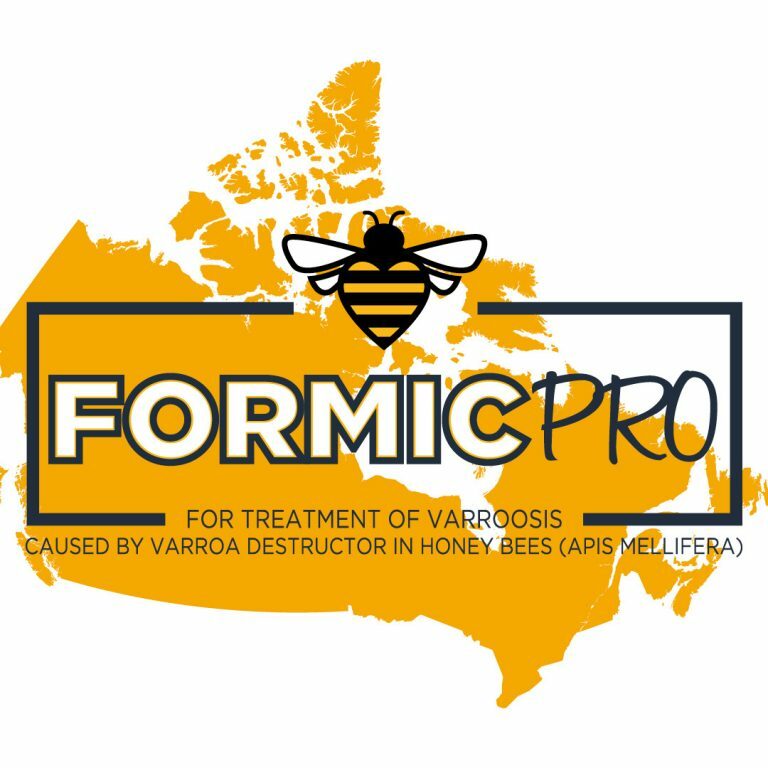 Frankford, Ontario – NOD Apiary Products is pleased to announce the USA registration of its newest all natural varroacide, Formic Pro™. The new product features a 24-month shelf life that distributors in the USA marketplace have been seeking. “Since being introduced to the US market in 2011, millions of honey bee colonies worldwide have been effectively protected from mites by Mite Away Quick Strips™ (MAQS™); yet our distributors were seeking an additional product with more lenient storage conditions while continuing to provide to their customers all of the easy to use characteristics of MAQS™. There are two treatment options when local thresholds are met: Option One: 2 strips for 14 days. Option Two: 1st strip for 10 days remove and replace with 2nd strip for an additional 10 days. 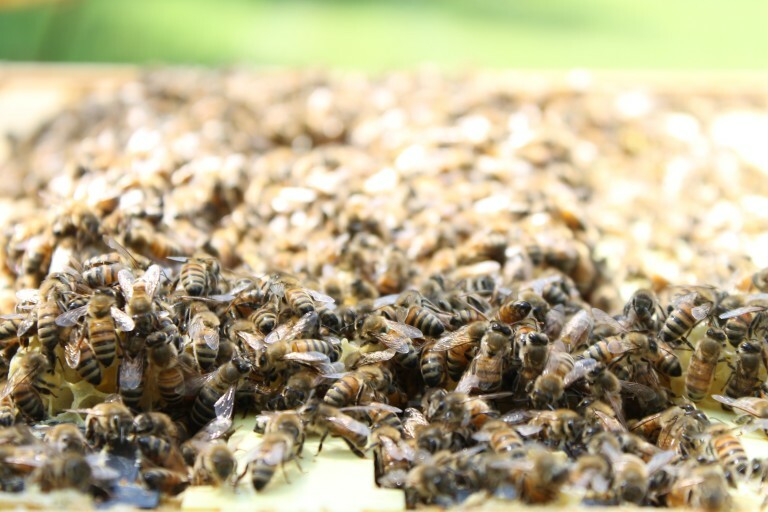 Formic Pro has an average of 83-97% efficacy and causes mortality to a significant number of mites under the brood cap as well as adult mites on the bees. Formic Pro doesn’t require temperature controlled storage. 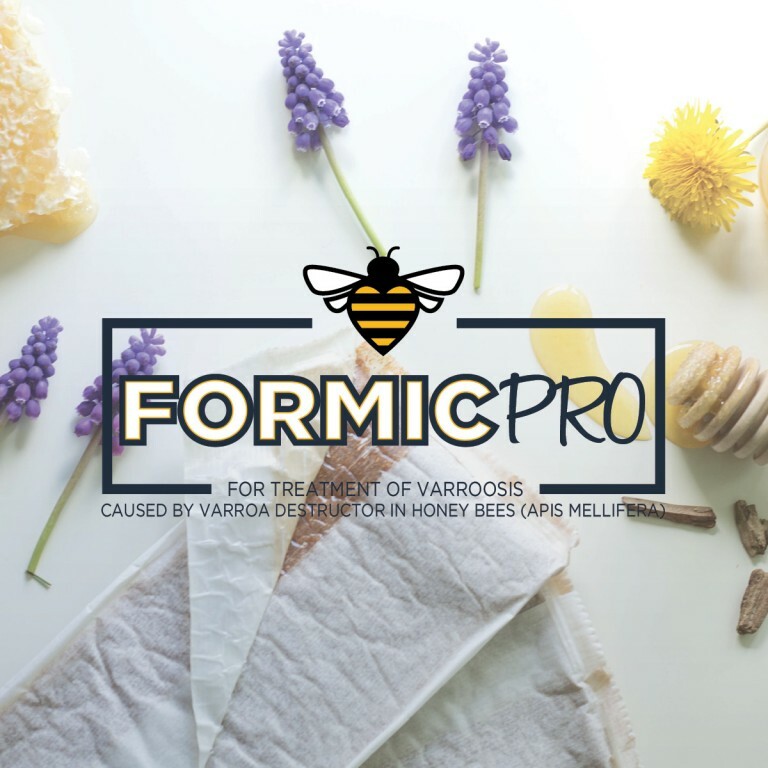 Formic Pro is an all-natural product that is fully bio-degradable and can be used during the honey flow without leaving residues in the honey or wax. On the horizon is another invasive mite of the honey bee: Tropilaelaps. NOD has been working with researchers in Thailand, testing Formic Pro™ against these mites. Our product proved to be the most effective. The USDA is monitoring for incursions of this mite in the US. Should it appear, with an amendment to the label the beekeepers will have a readily available tool to control it. 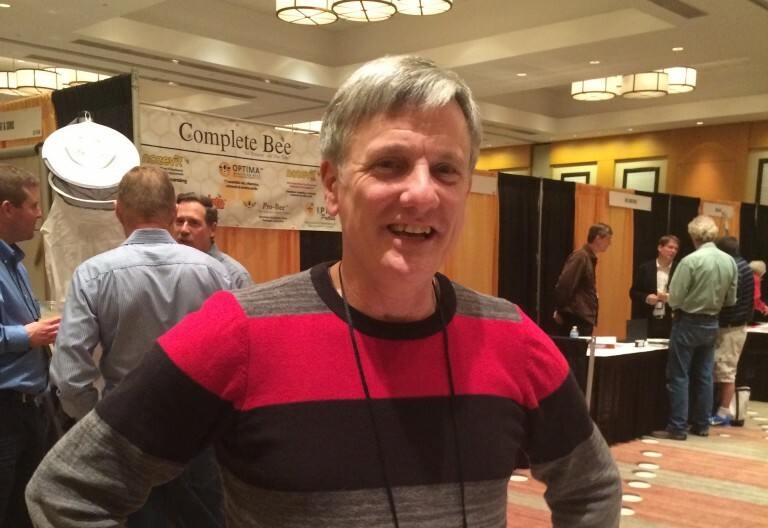 Frankford, ON – NOD Apiary Products Ltd. is pleased to announce the addition of Mr. Tom Nolan to the NOD sales team. Effective immediately, Tom will serve as the Sales Representative for NOD Apiary Products Ltd. and NOD Apiary Products USA Inc. sales team. He will also be responsible for keeping customer satisfaction the focus of NOD. October 7, 2014, Mite Away Quick Strips® (MAQS® Beehive Strips) gains Organic Certification from internationally recognized certifier BioGro. March 13, 2014. 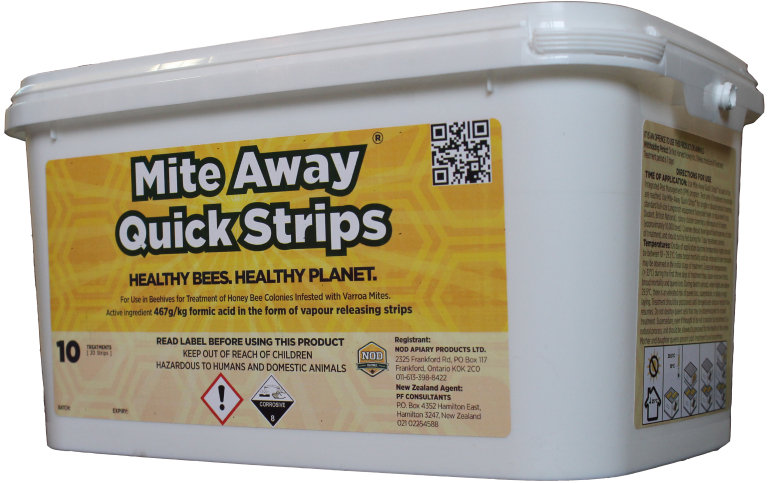 Mite Away Quick Strips® received registration in New Zealand for beekeepers’ use. Mite Away Quick Strips® has received approval by EPA (HSR100672) as well as the MPI, ACVM Group (P008556). New MAQS® 2 dose pack! Available in Canada, USA & UK! June 2013, Now even the smallest hobby beekeeper has access to using MAQS on their colonies. Visit your nearest beekeeping supply company to purchase.